WASHINGTON -- US Defense Secretary James Mattis on Wednesday threw his support behind a recent inter-Korean military agreement aimed at reducing tensions and preventing accidental clashes, amid reports that Washington opposes some parts of the landmark accord. 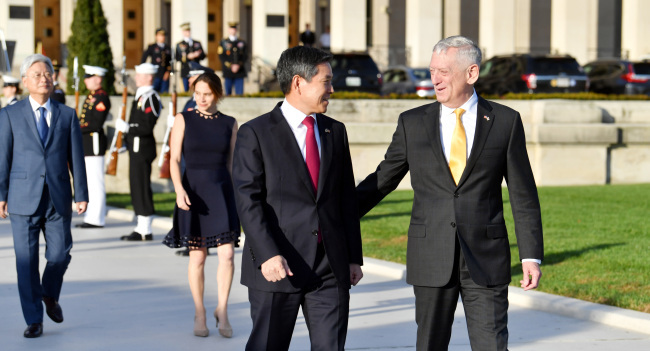 Mattis and his South Korean counterpart, Jeong Kyeong-doo, held the annual Security Consultative Meeting at the Pentagon to discuss alliance issues, including the transfer of wartime operational control and the proposed suspension of a joint air exercise. Mattis said "yes," when asked whether he supports the inter-Korean military agreement during a press conference after the meeting. It is the first time that a top US official made a public endorsement of the agreement signed by the Koreas' defense ministers after the third summit between South Korean President Moon Jae-in and North Korean leader Kim Jong-un in Pyongyang in September. The agreement entails disarming the Joint Security Area in the Demilitarized Zone, withdrawing some border guard posts, and setting up ground, maritime and air buffer zones. Some measures could restrict US military operations in front-line areas -- a reason why the US military has reportedly voiced unease over the agreement. During a meeting with reporters later in the day, Minister Jeong said that most of the US' doubts over the enforcement of the inter-Korean agreement have been addressed. "(The US) has shared the understanding that the allies will closely cooperate in enforcing the agreement to achieve the goal of establishing peace on the peninsula and realizing complete denuclearization, and agreed to actively support that," he said. Touching on the media reports that the US has expressed discomfort over an expanded no-fly zone in front-line areas, Jeong noted that Washington has agreed to proceed with the no-fly zone expansion as announced. Observers said that the no-fly zone could restrict US troops' border operations and drills, such as practicing a close air support mission and surveillance activities targeting North Korea's border long-range artillery. The joint SCM communique said that Jeong and Mattis determined that the inter-Korean agreement should be implemented in a way that contributes substantively to easing tension and establishing peace on the peninsula.